AN ARMY BOMB Disposal Team has carried out a controlled explosion on an old artillery shell found in a scrap metal yard in south Dublin earlier today. The artillery shell, which the Defence Forces say was “badly corroded”, was discovered by an employee at the yard who was examining metal that was handed in by a member of the public. Following a request from gardaí, the team arrived on the scene at 2.15pm. They examined the artillery shell in situ and the shell was then rendered safe for transportation to a military location. At this location the shell was destroyed by way of a controlled explosion. The scene was declared safe at 3pm. 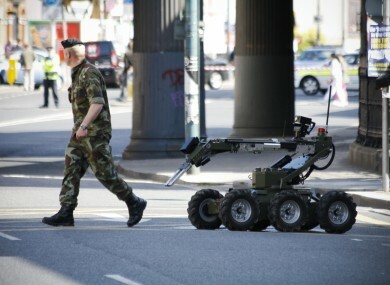 Email “Army bomb disposal team destroys old artillery shell found in Ranelagh”. Feedback on “Army bomb disposal team destroys old artillery shell found in Ranelagh”.